What it is: A precision, accentuating black liquid eyeliner. 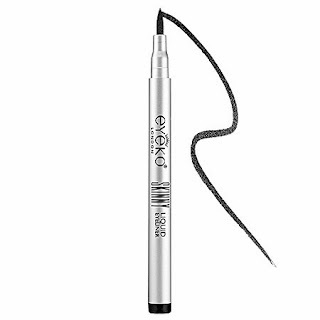 What it does: Featuring a long-lasting pigmented formula, this blackk eyeliner has an easy-to-apply, pen-style nib, allowing you to create thick feline flicks and defined lines for a smudge-proof finish. Apply a thin line along the lash line and inner rim or smudge outside the rim for a sultry, smoky effect. This gratifying, color-intense liner doesn't flake or fade and adds a unique touch to any look. I was on a search for another liquid eyeliner that was easy to use and waterproof/smudgeproof. I've been using MAC liquidlast for years and that is the ONLY liner that stays on without smudging on my oily eyelids. One thing I don't like is that it takes forever to dry and if it happens to get on my lids it's not easy to clean up--I have to use a q-tip with a little cleansing oil. So after searching for awhile I decided to give this one a try. My first thoughts--it's very easy to use--since I like doing somewhat of a thick line this gives me just that and it dries completely in a matter of a few seconds. I also like that it's pigmented giving an intense black color. But there are some cons--the tip dries out making it hard to apply after awhile and if I don't use any primer it gets on my lids so you have to use a primer with this. It still smudges down a little giving me a little raccoon eyes. I use this when I work but if I go out at night I reach for my MAC. So I did a 12hrs test with both eyeliners. After several washes with soap the Eyeko started disappearing slowly--by the end of the day it was almost gone but the MAC liquidlast was still there as if I just applied it. I will continue to keep using the liquidlast because I haven't found any other brand that stays on like it but the eyeko skinny isn't that great but it does the trick for when I just want to have a little something on my eyes when I go to work. I am still on a search for a better one so if you guys have any suggestions please leave a comment below. Also, which is your favorite eyeliner?